This triangulation station and related marks were on our to-do list for a long time. They are situated so close to the road that we figured they'd be effortless finds, and we felt sure another local benchmark hunter would recover them first. We needn't have worried. 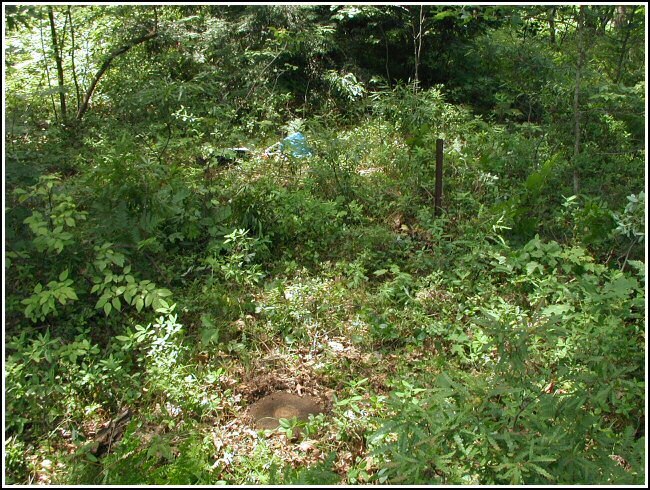 The marks may be just yards from the highway, but the station and reference marks are in an area heavily overgrown with blueberry bushes and were hidden beneath several inches of soil and plant debris. We found all four marks easily, including the azimuth mark, which is 0.2 miles south on Route 390 from the station, directly across the highway from the Bruce Lake parking area. All marks are in good condition and clearly legible; the station and reference marks are now flush with the ground. 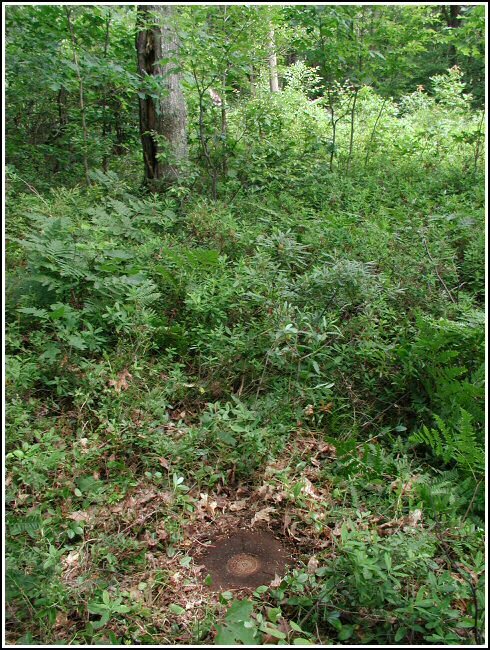 We were not able to positively identify the triangular blazed tree (note that there is some confusion among the datasheet descriptions whether this tree is an ash or an oak). 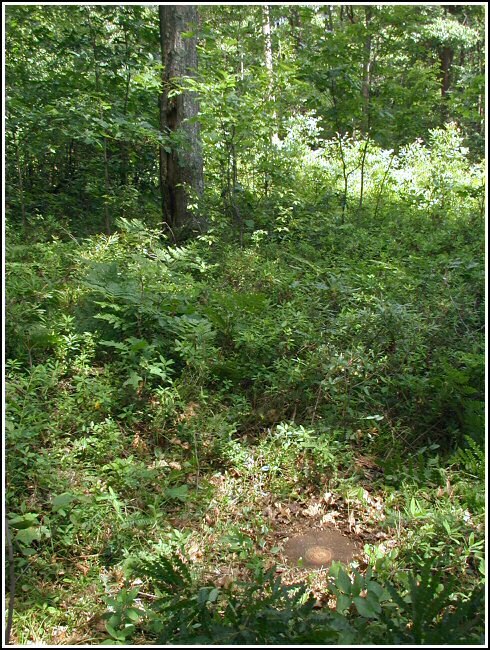 In addition, there is a stake near the station mark which was probably the witness marker mentioned in the description. There is no sign or other identifying feature. 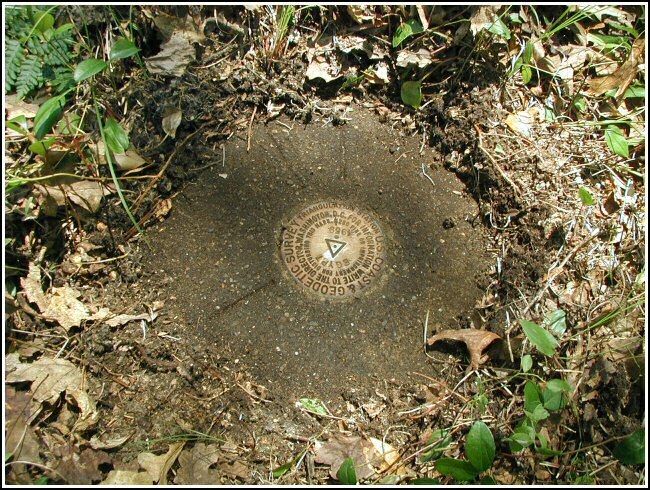 Near the azimuth mark, no witness marker was found. 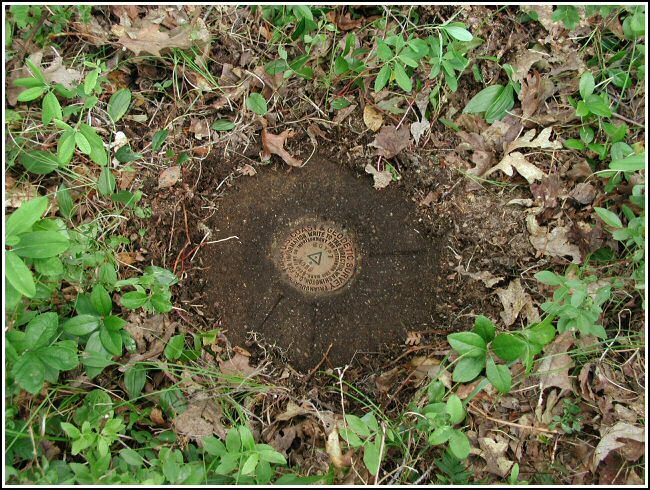 The station mark, both reference marks, and azimuth mark were recovered in good condition. The station and reference marks are about level with the ground. The witness post at the station mark still exists. The blazed tree was not found. 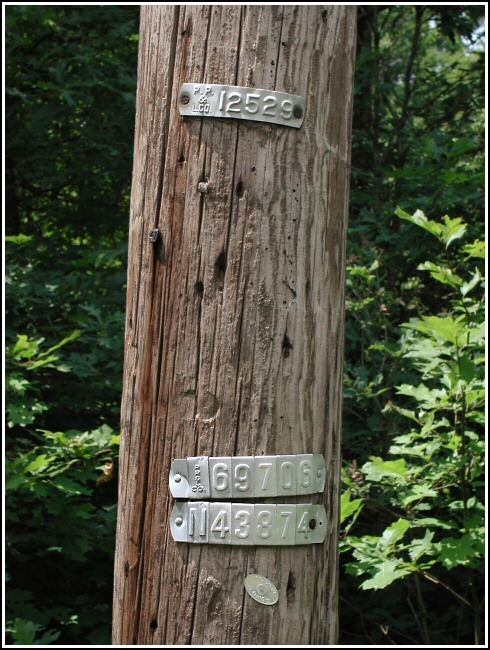 The power pole is numbered PP&L 12529/69706/N43874. The azimuth mark is located on the west side of Route 390, directly across the highway from the Bruce Lake parking area and trailhead. There is no witness marker at the azimuth mark. Handheld GPS WAAS-corrected coordinates: 41 20 28.98(N) 075 12 29.52(W). Eye-level view of the mark on the monument showing the three nails that point to the RMs and azimuth mark. Looking NE toward the once-blazed tree. The witness post 6 feet W of the mark. Looking SE toward RM2, where Rich stands. Station recovered in good condition. This second order triangulation station is located on the west side of Rt. 390 roughly 0.2 miles north of the entrance and trailhead to Bruce Lake Natural Area and situated on Delaware State Forest land. The 1959 “to reach” directions are still viable. The azimuth mark is also on the west side of the highway, near the shoulder of the roadway, and directly across from the Bruce Lake trailhead and parking area. 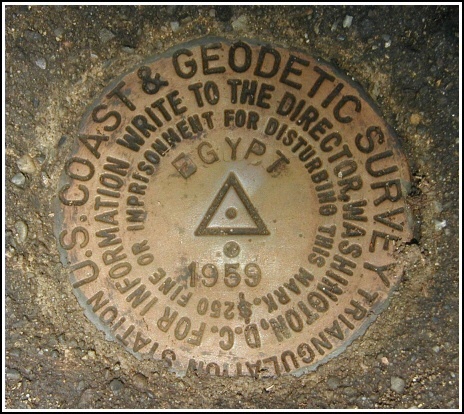 The station mark, the two reference marks and the azimuth mark were all found as described. There is a large old oak tree at about the right distance and direction from the station but the triangular blaze is no longer evident. 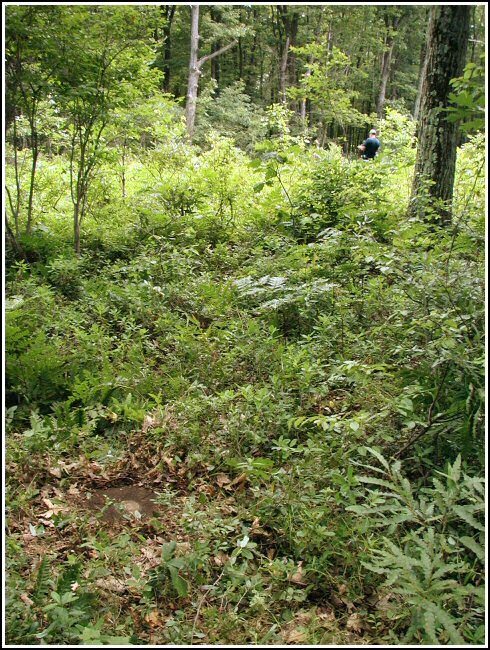 All settings had to be cleared of brushy growth and thick layers of loamy soil, roots and duff. The station mark is set in the top of a square concrete monument about level with the ground and 6 feet east of a metal witness post. The withness post is in poor condition and may not last much longer. RM 1 is about 3½ feet northwest of powerpole number PP&LCo 12529-69706-N43874 and about level with the ground. RM 2 is southeast of the powerpole and about level with the ground. 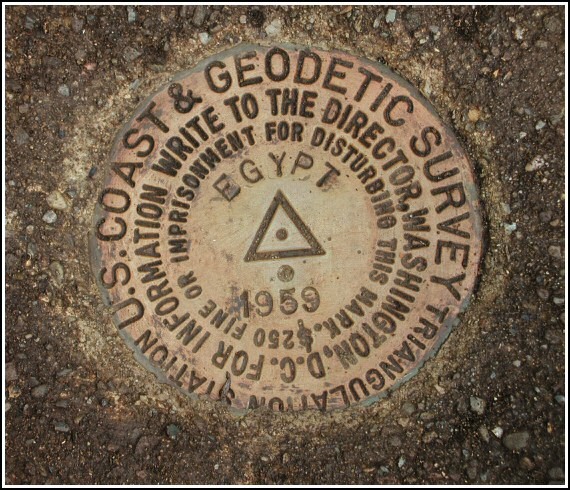 The azimuth mark is set in the top center of an outcropping boulder about 18 inches above ground level. 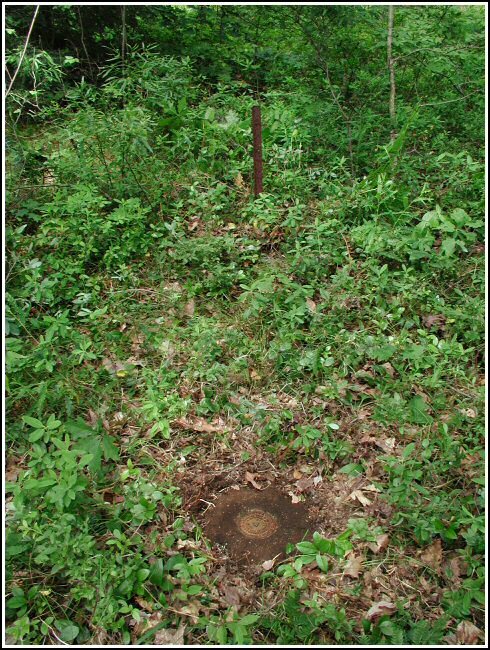 The metal witness marker was not found. 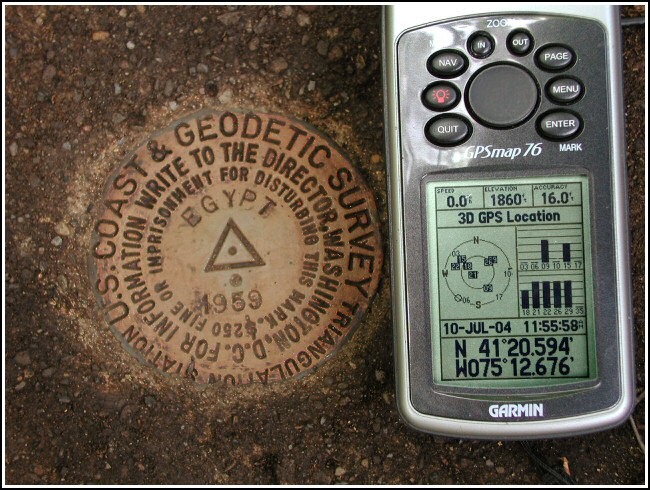 At the station a Garmin GPSmap76 receiver with active remote antenna was used to record autonomous (non-corrected) coordinates which were identical (within 0.001 minute) to the adjusted coordinates listed on the NGS datasheet. All marks are in good condition and the stamped designations are legible. LY1169, “EGYPT 1959,” Pike County, PA.
GPSr and the station mark. Eyelevel view of station mark and setting. Orientation view, facing west and witness post. Orientation view, facing RM 1 and powerpole.